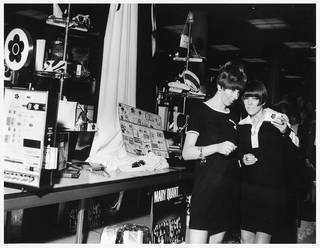 In this edited extract from the Mary Quant exhibition book, Beatrice Behlen explores why Quant's make-up range was as revolutionary as her clothing. Nobody had considered a colour other than red, pink or vaguely orange for lipstick or that there was colour other than blue and green and possibly purple for eye-shadow, so there was no flexibility and no fun with make-up. I had no doubts at all about my concept of the colours and products, as to me the need of the new was so glaringly obvious, but when the packaging and testing also went so smoothly and looked so terrific, it was the one time in my life I had total, total confidence in a venture's success. Everything co-ordinated out in the colours I wanted: the Colman's mustard and, you know, this prune-colour and putty, a putty-beige or an equivalent with a green in it and black and white. [...] I brought in those colours to the nail polish which, of course nobody had ever seen nail polish in colours like that. And lipstick and eye shadows, and so the colours worked with all that. 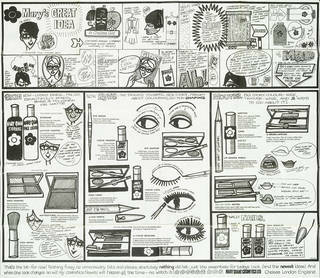 The journalists, buyers and sales representatives who attended the first launch on 28 March 1966, or the second a week later at Mary Quant's home, witnessed a make-up revolution: an entirely new packaging concept. In the mid-1960s, many, albeit not all, beauty products were sold in plastic containers designed to imitate more valuable materials such as horn or were 'all pale pink quilting and bogus gold', as Quant remarked. 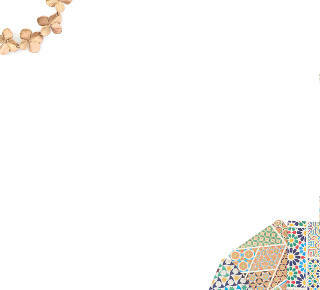 Declaring her love of the humble material – including its smell – Quant announced that her packaging was to be honest, 'hundred karat good plastic'. Reflecting Quant's desire for honesty and efficiency, lipsticks were sheathed in a brushed metal tube. Quant wanted something "you could pull out of your pocket, or your bag without it looking as though it belonged in a boudoir. I thought, why can't lipsticks look like a cigarette lighter?" The products' tongue-in-cheek but matter-of-fact names hinted at their intended effect or purpose. There was 'Starkers' – abroad it was explained that this was 'British slang for naked' – a foundation available in fair, medium and dark. 'To appear natural' was the desired effect for 'the new type of woman' and to get away from the masks created by pancake foundation. Journalist Margaret Allen writing in 1981 called this 'pale unmade-up look on the face and lips with all the focus on the eyes', the 'British' or 'London' look, which soon spread across the world. After the launch, reps and sales girls embarked on a promotional tour taking in several UK cities. At pop-up counters in department stores, customers were introduced to the new products by having half their face made-up by a consultant who would finish with dotting a small daisy (Quant's brand identity) near one eye. To help make sense of the new line, how and in which order it should be applied, a cartoon strip was developed, printed on fine paper so it could fold up into a small rectangle – a brilliant marketing tool. 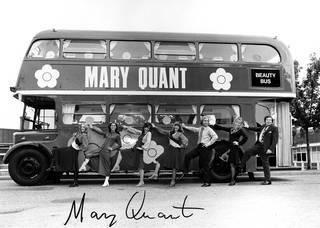 Possibly the most spectacular means of driving sales abroad was the Quant beauty bus: a bright red Routemaster, one of the distinctive London double-deckers which was internally stripped and custom fitted with long make-up tables, mirrors and swivel stools for make-up training and makeovers. Between 1970 and 1975, the original bus and its white successor toured around Europe, Canada, America and Venezuela. would bring home beautiful round Mary Quant bottles of nail varnish in amazing colours such as canary yellow, shimmery green and night time black. I could stare at these beautiful bottles for hours, the design was one of the best things I have ever seen. Mary Quant celebrated colour in all its spectrum and this had a huge influence on how I saw make up as an instrument of self-discovery and self-expression. 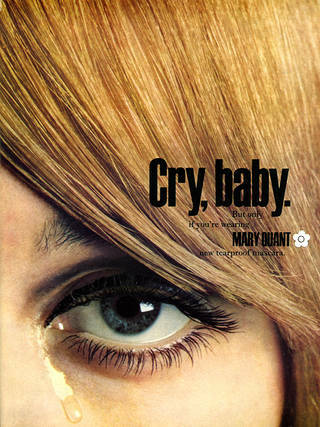 Adapted from an essay by Beatrice Behlen in the V&A book, Mary Quant, accompanying the exhibition.